Kathryn Brimblecombe-Fox: The Lyrical Optimism of Beauty. 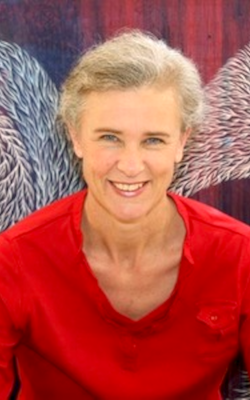 Published 20 August 2015 Dr Christine Dauber. Twenty first century cultural politics creates a paradoxical situation which is not new. The historical avant-garde fought for acceptance in a world that was hostile to change. In their artistic practice they posed questions that threatened their own existence as artists by challenging the orthodoxies of both painting and sculpture. In doing so, they heralded the end of art. Yet art continues, but what now constitutes art and aesthetic taste has dramatically changed to the point where it would be quite reasonable to ask ‘what is art? and what is beautiful?”. After having worked our way through an array of “isms” [such as minimalism, postmodernism and conceptualism] we are now exposed to a whole new range of experiences in the name of art – video art, relational art, post media work, to name just a few. Clearly then, the questions ‘what is art? and what is beautiful?” remain vexed, if not highly contentious issues and ones which, because of their complexity will perhaps continue to tantalize art historians and theorists forever. Consequently, to raise the issue of beauty in relation to art at this historical juncture seems, to me, to be an adventure into dangerous territory. Why? Because there has been a trend in artistic direction to be dismissive of works deemed to be ‘beautiful’ as there is a falsely assumed conception that beauty and politics are mutually exclusive. As Arthur Danto points out, this shift in direction has occurred as artists have embraced political agenda rather than those of an aesthetic nature. As a result, we have seen a proliferation of ‘art’ which is framed in terms of disharmony, conflict, and contradiction”. Whilst there is a possibility that this angst driven art has become the ‘new beautiful’, as it paradoxically realises its potential in its association with the worth of the idea behind it,  it is of interest here to consider the work of a painter whose pictures are not just beautiful in an aesthetic sense but also address major issues facing our world today. 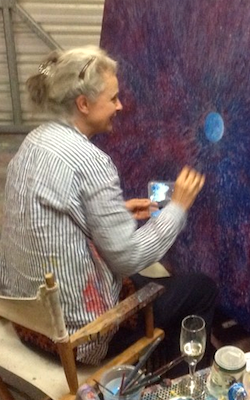 This painter is Kathryn Brimblecombe-Fox. Painting for Brimblecombe-Fox is a spiritual event. It is something that she has always done. Her work has a lyrical optimism that emanates from the beauty of the work itself and from the poetic nature of her supporting texts. Her personal oeuvre is both intelligent and understated. It comes with a big agenda – to make the world a better place in which to live. A daunting goal: but for Brimblecombe-Fox, optimism is a state of mind – a matter of choice – a way of always moving forward. This means that her painting is ethically driven, politically informed and aesthetically pleasing. Fuelled by her personal experience of a life lived in outback Queensland, the artist has focused her attentions on the land. Whilst there is a temptation to classify her oeuvre as landscape, these works do not fit easily within an idiom where scenery and gum trees define genre and thus limit interpretation. Therefore, it is necessary to look beyond, but not ignore, the merely literal. With this in mind, and in an endeavour to explore the process of development which is now apparent in the artist’s more recent work, her earlier ‘landscape’ pieces are of some interest here. Two iconic works, Cut Lines  and Mountains As Metaphors will be examined. 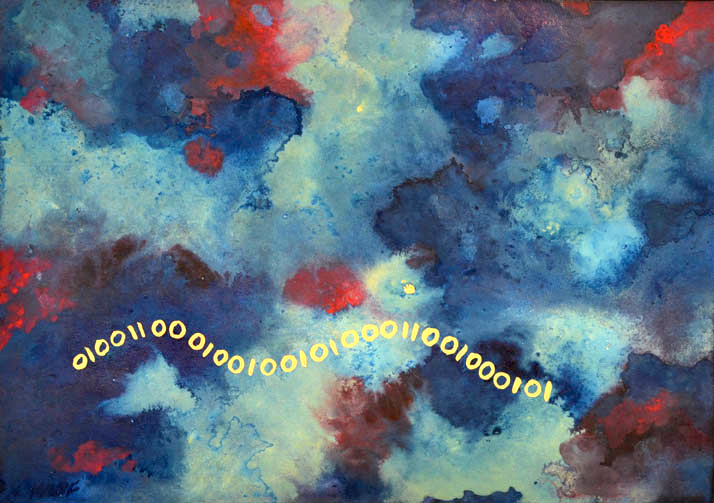 Exhibited at the Soap Box Gallery Brisbane in 2002 Cut Lines is a work of monumental proportions consisting of two pieces (watercolour and gouache) on paper, each seven hundred by one hundred and fifteen centimeters. Designed to wrap around the walls of the gallery, the work hangs horizontally not vertically. Thus the viewer is surrounded by the work at eye level and compelled to turn if desiring to see it in its entirety. This being so, it is the landscape itself that controls the destiny of the viewer. This affect is heightened by the sense that there is no clear horizon line, only the calligraphic suggestion of valleys and mountain tops which, because they are painted in an intense blue – broken only by psychedelic flashes of colour to indicate changes of contour – meld with the blue of the sky beyond which is to suggest an inimitable vastness. It is as though the artist is grappling with the infinite and overwhelming nature of the landscape itself. Art historian Sally Butler argues that for Brimblecombe–Fox “Landscape registers as a state of mind and a perspective shaped by personal experience”. Certainly this is so. For her work presents the land as an intellectualised space – a spatialised place to be experienced and felt rather than seen. Mountains As Metaphors with the startlingly red ground pushes this analogy even further so that we might see the traces of memory of place or, alternately take yet another journey of the mind to the metaphoric relationship of the land to human experience.This psychic dimensionality of her investigation lends credibility to her work in what, for contemporary Australian landscape artists, is a post Mabo context, for this earlier work is not so much about ownership but rather, the validity of experience itself. 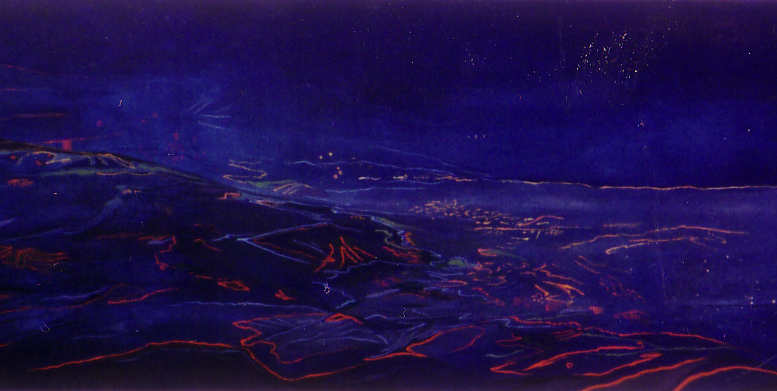 As Brimblecombe-Fox indicates, at the production point of her paintings, concepts relating to perspective provide a mesmerising fascination for her and it is this play that supports Butler’s suggestion that in the ‘landscapes’ Brimblecombe-Fox is ‘formulating a geometry of our environment’. Certainly both her past and present work does contain a certain formulaic quality, however, given the abstract element of affect in her painting, I believe that her images are not so much about ‘formulating a geometry of our environment’ which is to suggest the possibility of the attainment of some ultimate goal, or that one can in some way represent what may ultimately be unable to be represented, but rather its opposite – a total loss of perspective and with it a recognition of the unattainable dimensions inherent within the paradox of representation itself. Rather than limiting her ability to paint, this sense of aporia has opened a space to creative vivacity – a space of criticality which is at once both inside and outside her own medium. Similarly, in relation to Brimblecombe-Fox ‘s more recent work, the description ‘contemporary landscape artist’ can actually be deceiving, for although she still uses elements and images that are drawn from nature such as a tree, a leaf or an island, she travels in new dimensions as she expands her concerns with the landscape into global questions on ecology and world harmony. As an example, consider the image Earth for Sale [Oil on linen 2008] in which the artist pushes the boundaries of landscape. In the first instance, the landscape depicted is not intended to provide a representation of a particular place that we inhabit, but rather presents an imagined space which may or may not be a view of the earth from space. In a play of iconographic symbols, the ground takes particular form in a shimmering mass of minutely executed dollar signs as the image paradoxically foregrounds questions of consumption. Thus Brimblecombe-Fox adroitly turns to questions of ecology and abuse of the land. 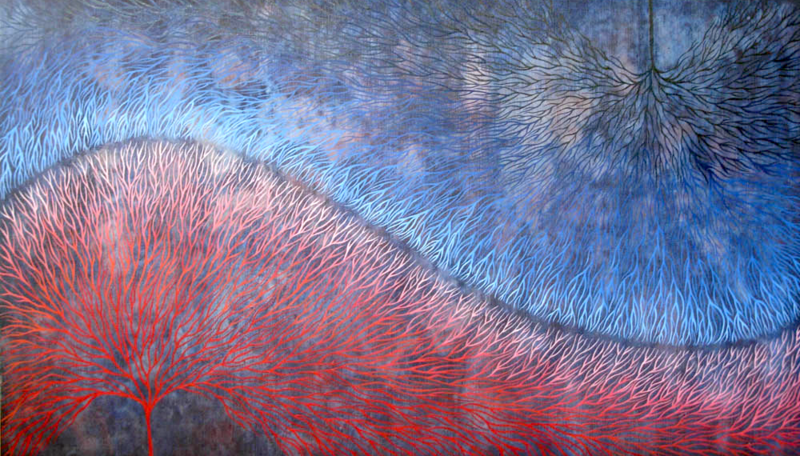 Again in Lifeblood [oil on linen 90x200cms 2008-9], the artist conjures a landscape that has no physical equivalent. This bold and dramatic image which considers the global dilemma of water as a shrinking resource demands that the viewer – in an echo of lived experience – examine the image from two vantage points: one near and the other at a distance. From a distance, the blood red land rises up in the jagged contours of the aquifer below. Rain falls from a menacing sky, not across the landscape, but in two distinct towers which echo the patterns and frustrations of nature itself. Closer to the image, it is possible to see that the ‘twin towers’, the substratum of the earth and the sinuous redband which hovers across the landscape are again delineated by the repeated use of very small dollar signs. This is an iconoclastic image and, at the risk of over determination, there exists a surfeit of meaning which has relevance in both local and global arenas. The snakelike band suggests an Indigenous presence which is to recognize, that in Australia, both water and land are precious and contentious commodities. The ‘twin towers’ have, since 11 September, 2001 been imprinted on global memory as being synonymous with terrorism and the collapse of world economic markets: here, they speak of world greed. Whilst this work is beautiful, it is not trivial but contrarily grapples with the ideological issues that haunt global politics today and in doing so seeks to express bonds of commonality rather than the disparateness of either, race, religion or politics. To this end, Brimblecombe-Fox’s images utilise an iconographical language that is global in its dimension. Her thematic use of arborial imagery provides a point of access which crosses both histories and cultures to collapse difference between east and west. To illustrate this statement consider the paining Hope in the Distance [oil on linen 80×120 cm, 2010] which was composed as a companion painting to Lifeblood [oil on linen 90×200 cm, 2010]. In fulfillment of the title, the ‘twin towers’ are replaced by four distant towers of sustaining rain. However, almost contrarily, it is the stylized image of the tree in the foreground which focuses the viewer’s attention. Not new to her image bank, the tree has a special significance in the artist’s work and to understand this it is useful to examine other works in which it figures. 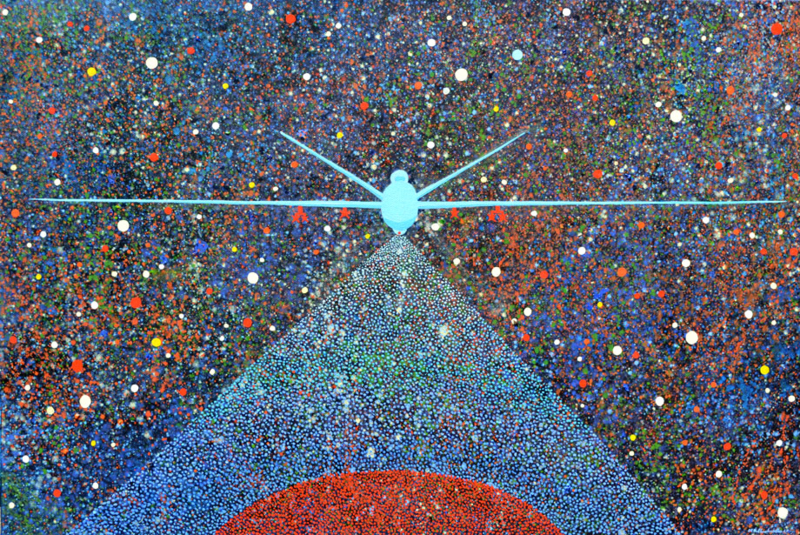 Consider the elements of the paintings Universal Symphony , Collective Memory , and Into My Galaxy [2008.] In both Collective Memory and Universal Symphony, using predominantly the colours blue, red and white, the artist has created a shimmering image of a leaf like structure which similar to an island, sits within a sea of colour. Central to that island and enclosed within a circular frame of oscillating colour, is an image of a single tree, which although leafless, does not appear lifeless as the mass of radiating branches create a sense of verdant potential. In the image Into My Galaxy, the tree retains its structure but it is now enclosed within a much more elemental space which is at once both male and female and significant of the very beginnings of human life. Despite the subtle changes in background in each painting, it is the image of the tree which remains largely unchanged. It is this figurative image which draws our attention here because to consider this tree as one from a littoral landscape would be a mistake. 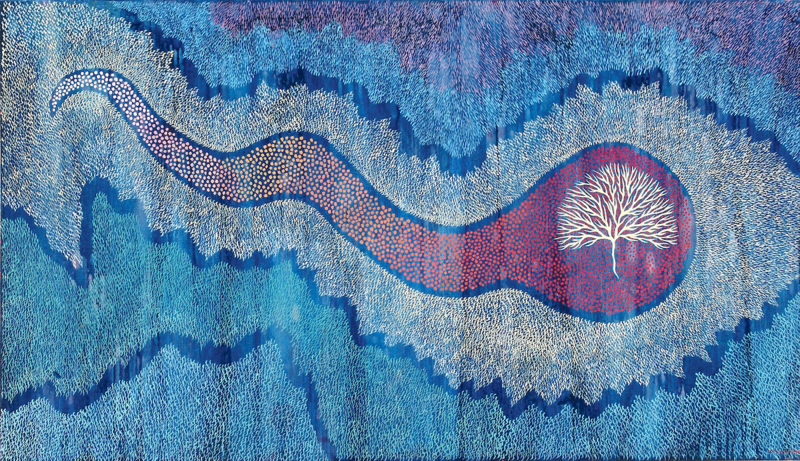 Given cosmic dimension as ‘the tree of life’, her imagery evokes both the visual and metaphysical world. Such arboreal symbolism has an extensive history dating from antiquity into the present and if we are to understand the metaphorical and symbolic subtlety of the artist’s work, it is important to review this history, if briefly. Of religious and mythical importance since antiquity,  the symbolism of a sacred tree or vine has been deployed not only in the Judeo Christian world but across many cultures including Asia, the Middle East and Europe and whilst the actual meanings and conceptions attributed to such iconography have differed, all such images have been associated with life, death and spirituality. Also associated with this imagery is the concept of immortality. Whilst the symbolism of the ‘tree of life’ was important in both early Christianity and the Sassanian Empire it was ultimately supplanted in both ideological cultures. In Christianity, the centrality of the Crucifixion ensured that the use of the cross, which itself could be interpreted as Christ , took the place of the ‘tree of life’ in importance although there remained an understanding that both the tree and the cross could be interposed. In the case of Sassanian culture, the advent of the Muslim religion – because of its disdain for the representative nature of art – ultimately saw images of the ‘tree of life’ reduced to ‘mere ornamentation’ . However, it has been argued by Zofja Ameisenowa that the image retains its importance in both the plastic arts and literature of both ancient and present day Jews. For Christians and Jews, the Old Testament Book of Genesis outlines a creation story which emphasizes the oppositional nature of two trees: one ‘the tree of life’ acting as the source for life and harmony with God and the other the ‘tree of knowledge’ – a source of knowledge but also of spiritual death. Once taken literally, the Genesis story of the Garden of Eden is now more often comprehended allegorically as an archetypal story relating to the growth of personality and its crises and the two trees are often interpreted as one where its ‘twofaced’ nature sets up a sense of tension and ambiguity . During the seventeenth century ‘the tree of life’ was understood to have symbolized both Christ and Heaven . In more recent times – since the 1960’s – the teachings of New Age spiritualism, which advocates concepts of ‘universal truth’ and the attainment of the highest possible human potential, have incorporated the cosmic nature of the ‘tree of life’ or ‘Holy Tree’ as a universal symbol of wisdom, protection, strength and bounty. The tree is also seen as the font of creativity. Taken from the Kaballah in its schematic form, it is seen as a fundamental teaching source in the spiritual life of the west. In its more treelike representations, two trees exist as one: the first being the trunk, branches and leaves and the second being the connecting network of roots systems needed to sustain the tree above [tree of life teachings]. The question which must be answered here is: how does this material relate to the work of the artist? It must first be understood that in these latter paintings, Brimblecombe–Fox is not so much concerned with landscape painting per se, but in a Warburgian sense, searches for the universal connections, or common ground between people, races and religions. In doing this she searches for a means to overcome the violence that exists in and between barriers to cultural understanding. Like Warburg she looks to mythology as a vehicle through which to explore spiritual linkages that are paradoxically different whilst being so familiar. 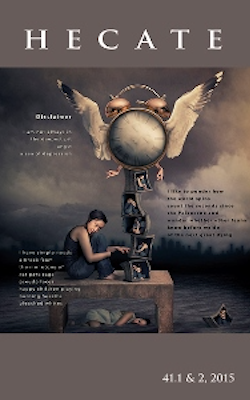 Through a dialectical proposition which is not intended to exclude difference, these linkages provide a raft on which to build opportunity – as in the concept of perspective – for both ‘distanced reflection and intimate connection’. Thus, she uses the ‘tree of life’ or ‘tree of knowledge’ as a repetitive motif and in so doing deploys its sacred associations as a global referent. At a symbolical and eschatological level these images instantiate spiritual concepts relating to the Garden of Eden or Paradise, offering an idealised locus for the production of a common ground. Thus, the traditional certainties that arise from such iconology are reworked to take on a more abstract elusive quality which fits well with her personal philosophy and aims which envisage the world as a better place in which to live. Whilst her lexicon may be informed by a new age spirituality – beyond the purely technical delivery of the images – Brimblecombe-Fox creates layers of meaning that explore some of the more difficult and profound questions facing our world today. Certainly, acknowledgement of ‘the tree of life,’ ‘tree of knowledge’ scenario, lends new meaning to Brimblecombe-Fox’s painting. In particular, re-examination of the imagery in Into My Galaxy shows that the enclosed space in which the tree sits metaphorically represents the womblike space of the hortus conclusus or enclosed garden. It is here within the nurturing feminine space of the garden that the tree springs to life. Although a traditionalist reading might still suggest a metaphorical equivalence between the tree and Christ, Heaven or Eden, it is useful here to consider more fundamental issues which arise from the oppositional nature of the two trees. To do this, it is necessary to examine the Genesis story of the Garden of Eden and the temptation of Adam and Eve. In Genesis 2 the Lord commands Adam not to eat of the fruit of the tree of knowledge of good and evil: ‘And the Lord God commanded the man, saying, Of every tree in the garden thou mayest freely eat. But of the tree of knowledge of good and evil thou shalt not eat of it: for in the day that thou eatest thereof thou shalt surely die’ . Despite the commandment, a serpent tempts Eve and offers her a choice for he tells her in Genesis 3 that if she does eat from the tree she shall not die saying, ‘For God doth know that in the day ye eat thereof, then your eyes shall be opened and ye shall be as gods, knowing both good and evil’ . Both Eve and then Adam succumb to temptation and eat the fruit from the tree. At a most fundamental level the tree – in its duality – offers the prospect of choice: a choice between knowledge and ignorance and between good and evil. At the heart of the gift there exists the concept of free choice. In this scenario, it is the element of free choice which gives meaning to the duality between the trees and it is this quality which ultimately inscribes our humanness. In her most recent exhibition Frisson, exhibited at the Graydon Gallery in March of 2010, Brimblecombe-Fox deploys these symbolic associations of the ‘tree of life | tree of knowledge’ to explore the concept of choice and with it the anxieties, thrills, fears and excitements that inherently exist at moments of decision making. These moments may be important at an intensely personal – microscopic – or global -macroscopic – level. This sense of tension is dramatically conveyed in the image Frisson in the auratic convergence of two opposing trees: the one upright and the other inverted. 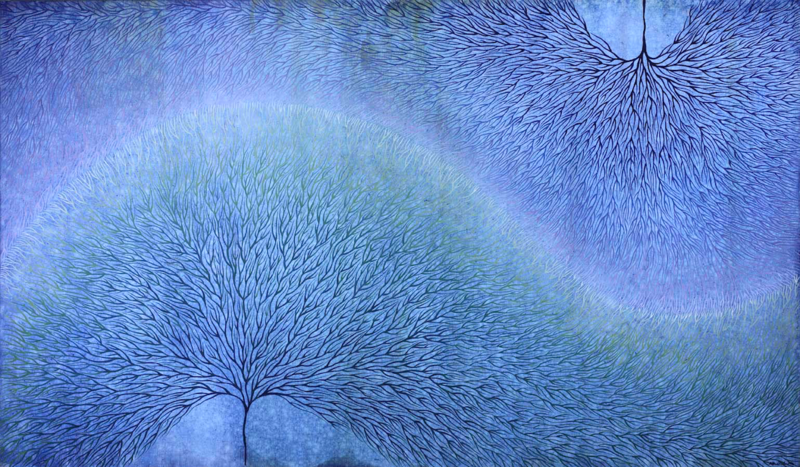 Paradoxically, in the image One [oil on linen, 90×200, 2009], the artist has chosen to depict not one, but a cosmic galaxy of overlapping trees in colours of blue, green, pink and yellow. These radiate outwardly from a single red tree. The cosmic nature of the image is increased by the star like nature of the background. Radiant in its visual presentation, this image explores the nature of unity but just what sort of unity is left to the viewer to decide. Whilst many artists dealing with politicised concerns may attempt to shock their audiences with the provocative bleakness and horror of a contentious world, to achieve her goals, Brimblecombe–Fox prefers to explore the more calming and optimistic qualities of the existential nature of beauty. This is achieved in the physical presentation of the work. Technically, she strives for and achieves a sense of ‘compulsive beauty’ which is not so much what Foster would describe as ‘a drive toward death’ but its opposite, a song of life. This sense of the surreal arises as the artist delivers an assault on the visual senses which is heightened by both the use of intense colour and an attention to brushwork which – with its ‘infinitesimal precision’ – inscribes the surface with passionate intensity. This painterly technique is most evident in what would be considered to be the negative spaces of the work which are taken up by a myriad of tiny repetitive strokes of the brush which deliver a shimmering aura to the surface of the paint. Whilst there is a temptation to consider this technique in terms of dot point delivery or even pointalism, careful and closer examination show that this intensive approach to the background provides not a filling in but an opening out as form and content meld to provide a space for reverie and contemplation on issues of process and mechanisation. 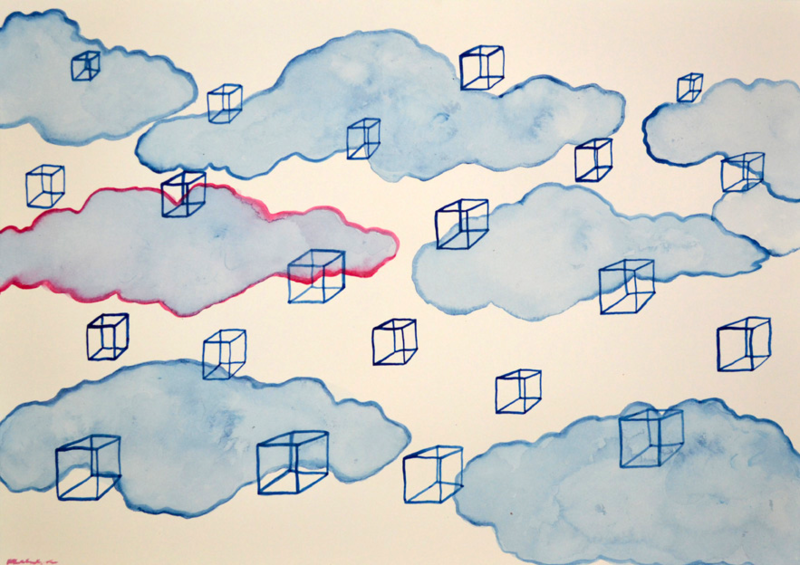 Header image courtesy Kathryn Brimblecombe Fox, This is a Landscape, Gouache on paper, 30×42 cm, 2001. Music Courtesy: Edson Lopes, Fantasia, Sylvius Leopold Weiss. Danto, Arthur C. What happened to Beauty? The Nation. 254: 12 (30/3/1992): 418-421. Gilbert-Rolfe, Jeremy. Beauty and the Contemporary Sublime. Uncontrollable Beauty: Toward a New Aesthetics. Eds Bill Beckley with David Shapiro. New York: Allworth Press, 2001. 39-52. Lynch, Andrew and Scott, Anne M, Eds. Renaissance Poetry and Drama in Context: Essays for Christopher Wortham, Newcastle, UK: Cambridge Scholars’ Publishing, 2008. 101- 129. Butler, Sally. Cut Lines: Kathryn Brimblecombe-Fox. Eyeline 49 (Spring 2002 ): 37-38. Tunnicliffe, Wayne. Wilderness of the Imagination: How Today’s Artists Play with Nature and Landscape. Look Art Gallery Of New South Wales 3 (2010): 29-31. Ameisenowa, Zofja. The Tree of Life in Jewish Iconography. The Journal of the Warburg Institute. 2:4 (April 1939):326-345. Bladen,Victoria. Arboreal Language and Otherness In Andrew Marvell’s Upon Appleton House (1651). Iverson, Margaret. Retrieving Warburg’s Tradition. The Art of Art History: A critical Anthology. Ed. Donald Preziosi. Cunningham, Adrian. Type and Archetype in the Eden Story. A Walk in the Garden: Biblical Iconographical and liturgical Images of Eden. Eds Paul Morris and Deborah Sawyer. Journal for the Study of the Old Testament, Supplement Series136. Sheffield: Sheffield Academic Press. 290-309. Foster, Hal….New York: Oxford University Press, 1998. 215-225. Tree of Life Teachings, 10 February 2010. http://www.treeoflifeteachings.com. Launching The New Horizon: Regular readers will know that I’m currently exploring contemporary surveillance in the broadest sense – visual surveillance, data collection and mining, online behaviour monitoring, physical tracking and so on. It also relates to the way I attempt to turn the surveillance back upon itself, by placing the viewer in multiple orientations, even simultaneously. Like with many of my paintings, over the years, I take a cosmic perspective which has the ability to oscillate at multiple close and far distances. Cosmology, the scientific study of the universe across all spatial and temporal scales, informs my visual oscillation. My interest in how contemporary technologies re-calibrate landscape and our responses to it is the driving force behind the current body of work. As regular readers know I am particularly interested in airborne militarised drones, surveillance and targeting signals associated with ubiquitous surveillance, and increasingly autonomous systems. It reflects a continuation of my attempt to renegotiate what landscape means in the 21st century. A century where the real and the virtual collide – and – where at the same time as humanity has succeeded in sending human-made technology into interstellar space, we also have people in conflict zones who are afraid of the sky – a droned sky. Kathryn has exhibited extensively including though not limited to London, Dubai, Abu Dhabi and in Australia. Her work resides in numerous collections…Saatchi Art profile here. Hecate, vol 42.1, 2016, discusses the symbology inherent in Kathryn’s most recent work. Hecate is a University of Queensland Interdisciplinary Journal of women’s liberation. Researching airborne militarised drones for over two years now, Kathryn detects an increasing dilemma in the enthusiasm for the civilian use of drone technology…read more.